Black salsify is an interesting, forgotten root vegetable that we have grown this year in our garden. It has a very mild flavor, some say it resembles asparagus. We enjoyed these fritters and are looking forward to growing more black salsify next year. As salsify emits a sticky milky substance, it is best to scrub the salsify and peel it using a vegetable peeler user running water. Once the salsify is peeled, use a food processor to coarsely grate it. 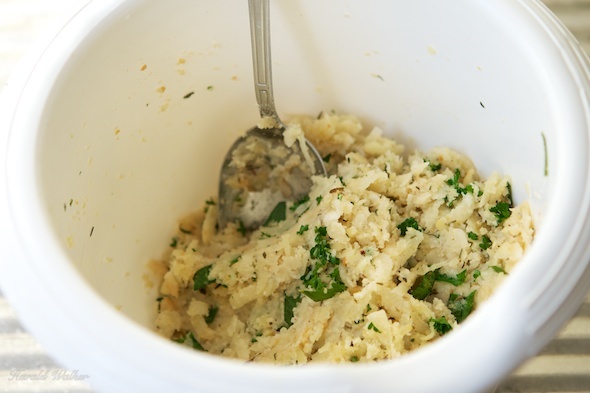 Heat the vegan margarine in a frying pan and add the salsify and thyme. Sauté the salsify until it begins to soften. It will be about 15 minutes. When the salsify has become soft, remove from the heat and place in a bowl. Add the parsley, garlic and the egg replacement. Form the salsify mixture into 5-6 patties. Heat the oil in frying pan and fry the fritters until golden on both sides. 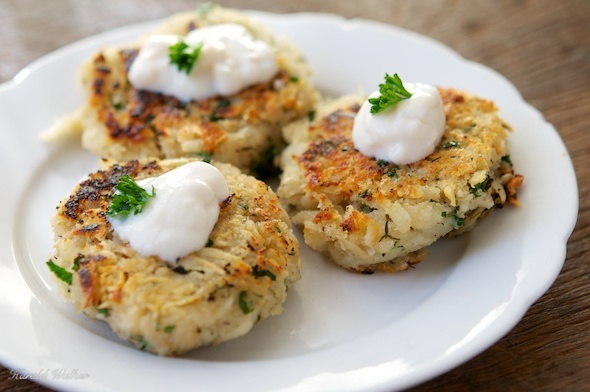 Lightly sprinkle a bit of lemon juice on each of the patties and top with a dollop of soy yogurt. Posted by Chris Walker on October 3, 2012 in Black salsify, Main Dishes.